The Kurds have often been described as the largest ethnic group in the world without their own state, numbering somewhere between 25 to 35 million in population. They mostly live in a region often referred to as Kurdistan, which stretches across the borders of Iran, Iraq, Syria, and Turkey. The largest population of Kurds live within the borders of modern-day Turkey numbering an estimated 15 million people, followed by Iran, Iraq, and Syria. They are the fourth largest ethnic group in the Middle East after the Arabs, Persians and Turks. The Kurds have been the victims of subjugation by neighboring peoples for most of their history. In the four main present-day countries in which they live, Kurds have fell victim to various discriminatory policies of oppression. They have been subject to some of the worst atrocities of mankind including ethnic cleansing and mass graves, genocide, chemical attacks and other bombings, the ban of their language and culture, displacements, the destructions of their lands, homes and properties, restrictions on social, political, and economical rights, and the burdens of poverty. The Kurds have attempted to set up their own nation-state several times throughout the 20th century but their efforts have been short of success every time. Following World War I and the collapse of the Ottoman Empire, the Allied powers drafted the Treaty of Sèvres to solidify the partitioning of the empire and to create nation-states throughout the region. The treaty contained provisions requiring Turkey to grant sovereignty to Arab Asia and North Africa, an independent Armenia, an autonomous Kurdistan, and Greek control over the Aegean islands commanding the Dardanelles. As a result of disagreements between the Allies, as well as a strong nationalist Turkish movement that opposed several of the required provisions, the Treaty of Sèvres was annulled and eventually replaced by the Treaty of Lausanne. This new treaty excluded any mention of the Kurds’ right to self-determination among other items. The 20th Century has been a century of a multitude of hardships for the Kurdish people living in their indigenous regions. In Turkey, Kurds have suffered cultural discrimination at the hands of the Turkish government. The Turkish government refused to recognize the Kurdish population for most of the 20th Century since the founding of the Turkish Republic, and instead referred to its citizens of Kurdish descent as “mountain Turks”. Until the late 1990s, the Kurds were unable to speak their own language publicly and there are still restrictions defined in the Turkish constitution restricting use of the language in public and political institutions. Journalists, activists, teachers, lawyers and politicians continue to be harassed and arrested arbitrarily on terrorism-related charges for their work on Kurdish issues. Today, while cultural rights are still mostly withheld, a seemingly unending economic problem exists in the Kurdish southeastern region of Turkey with unemployment levels reaching as high as 70% and continuing to remain the highest in the country. A prime contributor to this problem may be the millions that have been displaced as a result of the ongoing conflict between Kurdish rebels and the Turkish military. In the late 20th century, as many as 4000 villages were destroyed by the Turkish military – according to the Internal Displacement Monitoring Centre – causing over 3 million to be displaced with no government compensation. On a December evening in 2011, 34 Kurdish civilians were killed in a Turkish airstrike when they crossed the border from Iraq into Turkey with smuggled goods. They were mistaken for members of the outlawed Kurdish rebel group PKK on footage obtained by a U.S. drone. To this day (February 2015) the families of the victims have found no justice to the massacre deemed “a mistake” by the Turkish government and military. In Iran, Kurds have also suffered economic hardships. The region in which the Kurds live has been described as among the poorest and least development regions in all of Iran. Kurds in Iran successfully established a semi-independent state with Soviet backing in the mid-20th century. However, the “republic” fell within a year and its leaders executed when the Soviet Union withdrew its forces from Iran. During the decades that followed, the monarchy put several limits on the social and cultural activities of the Kurds in Iran. Following the Islamic Revolution, the newly established theocratic regime suppressed the existing Kurdish movements and executed several Kurdish leaders in the following years. In the early 21st century, Amnesty International released a report stating that Kurds were the most targeted ethnic group in Iran, noting that the majority of executions per year are carried out against the Kurds. Many Kurds who have been arrested and executed over the years have been political prisoners and human rights abuses continue to today. There are regular reports of unjust court trials based on vague charges of “enmity against God”, denial of access to a lawyer, maltreatment in prisons and execution by hanging. In Syria, the fate of the Kurds has not been very different than that of Kurds in the other indigenous regions. The Syrian Ba’athist regime has essentially outlawed the Kurdish identity in Syria by refusing to grant at least 20 percent of the Kurdish population their citizenship. As a result, many Kurds are unable to gain access to the most basic public services enjoyed by the rest of the population in Syria. Furthermore, they do not have the option of leaving Syria because they lack any internationally-recognized documents. Human rights organizations continue to report on the ongoing abuses against the Kurdish population at large by the Syrian government. As a result of the Syrian war and the rise of the Islamic State Kurds in Syria have established a self-ruled region called Rojava which spans parts of northern Syria. Rojava is an inclusive system where local communities and groups have great influence on political and social issues. These communities are diverse and include Kurds, Arabs, Turkmens, Christians and so on. The self-rule practices education in mother tongue and promotes women’s rights. In Iraq, Kurds suffered the tragedy of genocide at the hands of Saddam Hussein’s Ba’athist regime. At the beginning of the 1980s, it was reported that Saddam Hussein had particularly targeted Kurdish tribesmen who were opposed to his regime’s discriminatory policies against the Kurds. In one instance, 8,000 members of the Kurdish Barzani tribe were targeted and killed by the regime. Throughout the 1980s, Saddam Hussein’s regime carried out a genocidal campaign called “Anfal”, which included chemical weapons use, abductions, transfers and internal displacements, identifications and executions. According to official numbers, an approximate 180,000 Kurds were killed. The most infamous attack against the Kurds during this period was the chemical bombing of the city of Halabja in which 5,000 people (mostly women and children) were killed instantly and thousands more suffered long-term effects. Saddam Hussein’s regime destroyed at least 4,000 villages during the Anfal campaign. Mass graves continued to be unearthed in Iraq in the early 21st century decades after the campaign had been launched in the 1980s. Today, the Kurds control three provinces in Iraq in which the majority are of Kurdish descent. In the 1990s, most of the region was protected by the no-fly-zones established by the U.S., U.K., and France following the first Gulf War, and the Kurds practiced self-rule throughout this period. In 2003, Kurds allied with the international coalition and helped overthrow Saddam Hussein’s regime. Since then, Kurdish leaders and politicians have opted for a more international role, building political and economic or business ties with foreign nations. The new Iraqi constitution recognizes the Kurdistan region in Iraq as an official federal entity or state. 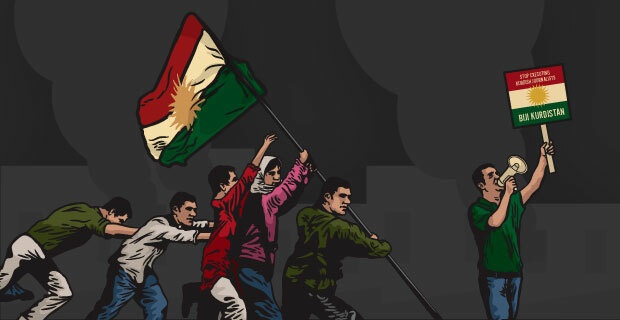 The Kurds have established a government called the Kurdistan Regional Government (KRG) that governs the region. The issues remaining at large for Kurds in Iraq is continued protection under the Iraqi constitution as a minority, and the status of the Kirkuk and Nineveh Provinces in which a large number of Kurds reside but are currently outside control and security of the KRG. Considerable pressure remains on the Kurds in Iraq as they negotiate with Baghdad, and are forced to deal with the concurrent and delicate relations with Turkey and Iran. A tragedy befell the Kurdish Yezidis when Islamic State attacked their villages in the Kurdistan Regional Government and Iraq in August 2014. More than 200,000 Yezidis sought shelter in the mountains while around 5,000 were killed by the Islamic State. Girls and women were raped and sold into sexual slavery by the Islamic State. Mass graves with bodies of Yezidis continue to be uncovered. You can stay informed about violations of Kurdish rights and other Kurdish issues through our articles on the site.